AIM – Awareness India Movement, social service, youth organization. It is a kodambakkam, chennai based organization which was started three years before by the inspiring speeches of Dr. A. P. J. Abdul kalam and decided to dedicate themselves for the dream “vision India 2020” and It works to make a better future of the society in which we are living in. On this it had started a project called “Clean and Green Chennai project, kodambakkam” to make awareness among the people about the importantance of clean and green environment. Later on it involved in action along with awareness, but because it had not brought any permanent solution the association came up with a new idea of making a ‘model environment’. On last Sunday (27/09/2015) AIM members along with the NSS students of Ethiraj College and S. I. V. E. T college grouped together in 4th cross street, U.I. Colony, kodambakkam, chennai-24. Before the event an introduction meeting was held in Cine city hotel which covered a welcome speech, a special speech by the guests and instruction to the students and youngsters on how to clean and to handle garbage. 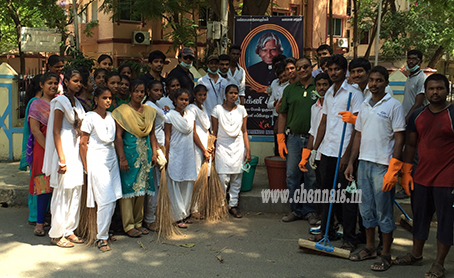 Also to ensure their safety, gloves and masks were provided along with the cleaning equipments. The event was kick started by Dr. S. Lankeswaran, MD., Cine city hotels and also Chairman of Madras Knights Round Table 181. And Mr. LIC. M. Manikam, Chairman, zone x, Chennai Corporation. On this the garbage left unattended on the road sides and debris were cleaned completely, garbage bins were arranged properly in its place and the public were instructed to throw garbage’s only in garbage bins, parking of vehicles were made on one side of the road in a proper manner, platforms were cleaned and painted with black and white, big size flower pots were filled with proper combination of sand and mannur and it was placed in the road sides and at the entrance of every house and flats with flowering plants planted in it. Finally the residents of the street were met by the members of AIM individually and explained them about the cleanliness and also requested them to take care of their premises and the flower pots placed at their entrance.